According to a 2014 report by the Equality and Human Rights Commission the turnover of more than £8 billion in the non-domestic cleaning sector is brought about by about half a million “largely invisible” workers. These are mostly women, for a large part of color, stemming from East and West Africa. Many work on an informal basis without any job security. So far this has entailed that their fear to lose their jobs prevented them from taking action to ameliorate their living conditions. It’s promising for the workers’ struggle, not only in Great-Britain but across the whole of Europe as well, that this part of the proletariat has come into action. The employer of those on strike is one of the richest enterprises of the United Kingdom: Serco Group plc, an outsourcing company. For its customers Serco exploits public and private transports, exercises road traffic controls, has activities in air traffic, weapons industries, detention centers, call centers, prisons and schools. In 2016 Serco’s turnover amounted to about £3 billion. This year it engages 50,000 employees. Its CEO is Rupert Soames, grandson of Winston Churchill, who ‘earns’ £850,000 per year plus bonuses. On Friday April 8 Seco apologized by saying that the measure had been taken by the initiative of a local manager. The tea breaks have officially been restored. This wildcat action shows that collective struggle is possible and rewarding. In addition, the strikers are encouraged by successful strikes in the cleaning branch like those at the London School of Economics against the Irish outsourcing company Noonan. The current strikes are organized by the largest British trades union, Unite, that is federated with the T.U.C. The sudden combativity among the cleaners has taught Unite that more workers’ reactions will be organized by the workers themselves, outside of the union. In order to anticipate on this, and to obtain the leadership over an inevitable movement among support services workers in the hospitals – and maybe in other enterprises as well – Unite has called a ballot among its members in June for a 48 hours strike at the beginning of July. Because this has made no impression, it was followed up by a fortnight strike on from July 25, with more actions to come in August and September if necessary. The trades union Unite focuses the action’s demands on a pay rise of 30 pence per hour in the first place. 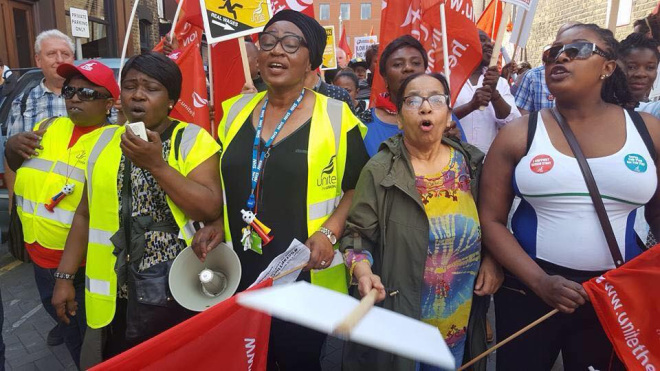 This demand is linked to Serco’s promise to pay all workers in London the usual minimum wage of ₤9.75 per hour, which is supposed to suffice for paying the higher costs of living in the London area. But several sources indicate that these costs have risen to such heights that it’s impossible to pay the rent, to pay for food, clothing etc. from this minimum wage. Many cleaners, as appears from The Guardian, are forced to take one or two additional jobs in order to make ends meet. As a consequence they hardly see their children, or even do not see them at all, and have no time left for a social life. These issues are common among all lowest paid workers in the London area. They all are watching the trade union’s action at the hospitals in the hope they succeed… or they may be looking at their failure. Apart from the issue of too low minimum wages, however, something else may be of even greater importance. Since Serco has taken over facility services, new managers have been employed on the work-floor who do everything to increase the exploitation of the workers. Activities like the serving of meals to patients have been discarded. Keeping in contact with the patients is however of great importance to the cleaners because of the appreciation and the status that this entails. Instead they are currently being pressurized by Serco into cleaning ever more departments, the weakest among them the most seriously. The consequences are devastating to both the hygiene in the hospitals and the health of the workers. In addition, the working pressure leads to unpaid overtime work and exhaustion, notably with elder employees. In other cases cleaners are forced to take over the task of health assistants (assistance to nursing personnel) without extra training. In short, Serco has begun to earn back its investment with an aggravation of tasks, an intensification of labor on a large scale. From many situation, also in the Netherlands, we know that the trades unions are all too eager to assist the management with this kind of restructuring of labor. But in order to succeed in this the union has to crack up its credibility with the employees first. It goes without saying that they’d welcome some extra members, paying financial contributors as well. The wildcat action had (evidently) not been announced and took the management completely by surprise. By contrast, trades union actions are all announced in advance, so the Serco management can take its precautions. And Serco does so indeed: through temporary employment agencies willing workers are hired who have no right to a strike benefit from the union, and who will immediately lose their jobs if they would join the strike, as some have expressed they would like to. In the wildcat action the workers decide on everything. Now it’s the union that decides. The wildcat action has taken place on the work-floor, enabling the workers in action to immediately act on an engagement of strike breakers. Now, under the leadership of the trades union, they are picketing at the hospital gates, where they cannot discern strike breakers from the countless patients, visitors and nurses who go in and out at a hospital. The long duration of the actions is certainly not to the advantage of the strikers. What matters is extending actions rapidly towards other categories of workers in the same enterprise (here: towards nurses, laboratory workers, doctors, etc. ), towards other enterprises and sectors, for instance to the low paid workers there. A struggle encapsulated by a trades union that focuses on a sector or trade, by contrast, impedes this necessary extension of the struggle. The trades union does not aim at this extension at all, but at its recognition by Serco and by the state. According to the aforementioned message on Libcom, in the case of Unite it is clear that the president of the union, Len MacCluskey, is an important supporter of Corbyn’s leadership over Labour, and that he has expressed himself in favor of restrictive immigration controls. Well, it’s also known that Serco checks the immigration status of its employees, and, when this is esteemed necessary, has them deported. It is not a coincidence that Serco is in the business of exploiting detention centers as well! It’s important that the cleaners – many of whom have an immigration background – not only understand well who their employer is, but also who the trades union is that pretends to fight for their interests! (3) At the National Health Service doctors lately have been forced to carry out identity controls in order to keep out “illegals”. Latest corrections: 6 August 2017. Serco has begun an intensification of labor on a large scale. From many situation, we know that the trades unions are all too eager to assist the management with this kind of restructuring of labor. But in order to succeed in this the union has to crack up its credibility with the employees first.